Ben Sherman Big Men's Vintage Style Leather Fashion Belt XL FIT WAIST 38"-42"
Ben Sherman Woven "Webbing and Buffalo Leather Belt" RRP £35 "Free p&p"
Ben Sherman leather Belt. Brand new in original plastic packaging. I bought this for my son for Xmas and he's never used it so I'm selling . It is a top quality bonded leather belt with logo . 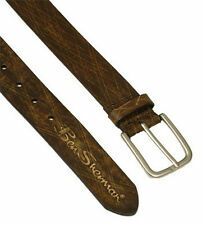 Ben Sherman Brown Leather Belt. Condition is New with tags. RRP £24.99 Brown leather colour, with brass buckle. Size is large with is roughly 37-41 inches. Dispatched with Royal Mail 2nd Class. Not returns, No shipping outside the UK. Ben Sherman large black leather belt 3 cms wide x 46” long, holes at 39.5” - 43”. Condition is Used. Dispatched with Royal Mail Signed For® 2nd Class. Brand: Ben Sherman | Material: Bonded Leather |. Full length including buckle: 42". Belt width: 3cm. Ben Sherman Black Leather & PU Mix Belt Size L 38"-40"
Full length including buckle: 48". Belt width: 33mm. in good used condition. 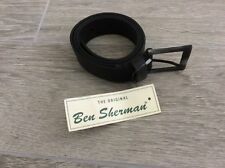 Ben Sherman Leather Belt 48" - 53" XXXL. The Original Ben Sherman. Size: 48" - 53" waist. Genuine leather. I am selling 2 Brand New, complete with tags Ben Sherman Belts. One in Black the other in Brown They are both Large but should you require any specific measurements or photographs, please do not hesitate to contact me. From a smoke and pet free home. Postage costs cover packing materials. Any questions please ask. Thank you for your interest. Brand: Ben Sherman | Material: Leather |. BNWT Ben Sherman leather belt. Black on one side, dark brown on reverse. Width of belt 1.1" Buckle length 2" width 1.5".